I always hear people say “If you can read, you can cook” or “As long as you are organized, you can get dinner together.” I believe both of these maxims to a certain point, but the older I get and the more I hear from parents struggling to get dinner on the table every night, the more I feel like we’re ignoring a bigger obstacle in the kitchen. And no, I’m not talking about the two-year-old pulling on our skirts as we attempt to boil water, though that’s certainly legit. Mostly, I’m talking about confidence — or, more to the point, the lack of confidence that holds so many of us back. I signed up for an art history survey class instead. Class participation — those two words scared the living daylights out of me. I had a crippling fear of public speaking that could be sourced to one feeling and one feeling alone: Why does anyone care about what I have to say? * I’d look at people talking in meetings or at conferences or giving toasts at weddings like they were superheroes who had cracked some mysterious code. How do they have the confidence to just get up there, offer their thoughts, and not turn fifty shades of magenta like me? How do they get up there and not allow the anticipatory dread of public speaking to upend their lives? I thought about all this last month when I was speaking at a conference in Chicago. There were about 200 people in the room and I had typed up my notes on the flight only a few hours before I got up on stage. The topic was something I had spoken on before, but still, I don’t think there was a minute where I was thinking what I used to think in these scenarios: I just want this to be over so I can have my appetite back. So what changed? How did I get over it? And what does the heck does this have to do with cooking and those crazy looking meatball sliders up there? The short answer is, I had no choice but to get over it a few years ago when my first book came out. Much to my horror, I found out quickly that writing a book was not only about typing away on my laptop while sipping Americanos in the local cafe. (Actually writing a book isn’t at all like that.) Apparently, once the writing part is done, there are readings and conferences and, if you’re “lucky,” media appearances and parties where toasts and speeches are required. I am not complaining…except I am. The excitement of publishing Dinner: A Love Story was almost overshadowed by the anxiety I had about getting up to speak at these events. Almost. I’m not going to shatter anyone’s world by revealing what cured me, but my solution was a) to prepare like mad and b) to do it. And screw up. And do it again. And screw up. And do it again. I learned something small every time I got up there (not a good idea to write complete sentences on your reference cards if you don’t want to sound like a robot; that there’s no shame in having a half glass of wine beforehand if at all possible) but I also took away something big: I was judging myself way more harshly than anyone else was. In this way, those of us who want to learn how to cook should feel grateful for the relentlessness of cooking for our kids, right? Think about it: They demand to be fed every single night. That’s a lot of nights to figure out when to recognize that the chicken should come out of the pan when it’s firm to the touch but not rock hard; to figure out that wow, smoked paprika is a lot more powerful than regular paprkia; to realize that replacing dried canellini beans with canned is generally going to be fine, but replacing fresh green beans with its canned counterpart generally is not; to learn that your kid will eat black bean burritos if you leave out the black beans; to learn that maybe next time you have four people over for dinner, you don’t cook one ginormous bunch of farm-fresh spinach that wilts down to approximately one cup of farm-fresh spinach; to get over feeling like a fraud. It’s a lot of nights to screw up, and learn, and acquire an instinct, so you can do it right tomorrow. *Yes, the blogger recognizes the irony of this statement. Giveaway! Comment below to be eligible to win a free copy of Mastering My Mistakes in the Kitchen. Contest ends 11/11 at 8:00 ET. Must be a US resident to win. (But obviously anyone can comment!) Good luck! UPDATE: The winner has been chosen (bearsmama, #124). Thanks for playing everyone. 1. Preheat the oven to 425°F. Line a large rimmed baking sheet with parchment paper. 2. Put the bread in a large bowl, add the milk, and let the bread sit until it’s softened, about 2 minutes. Scrunch the bread with your hands so that it almost forms a paste. Add the egg, parsley, basil, Pecorino, salt and pepper and mix until uniformly combined. Add the ground pork and sausage and knead gently to combine. 3. Fry a little tester patty in a skillet and adjust the seasonings as necessary. 4. Use a small (2-tablespoon-size) ice cream scoop to form the pork mixture into 30 small meatballs. Gently roll each meatball in your hands until smooth. Line them up on the prepared baking sheet, leaving a little space between them. 5. Bake until the meatballs are just firm and an instant-read thermometer inserted in the middle of the meatball in the center of the baking sheet registers 150°F, about 15 minutes. 6. Meanwhile, put all the ingredients for the sauce in a small bowl and stir together. 7. 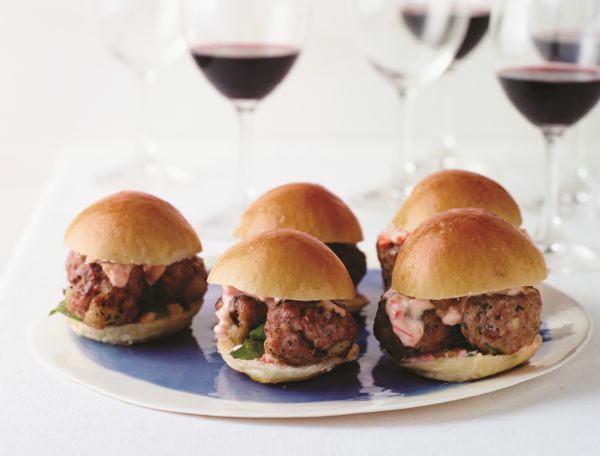 Top the bottom of each slider bun with 2 meatballs and some arugula. Add on plenty of giardiniera sauce and the tops of the buns and serve. 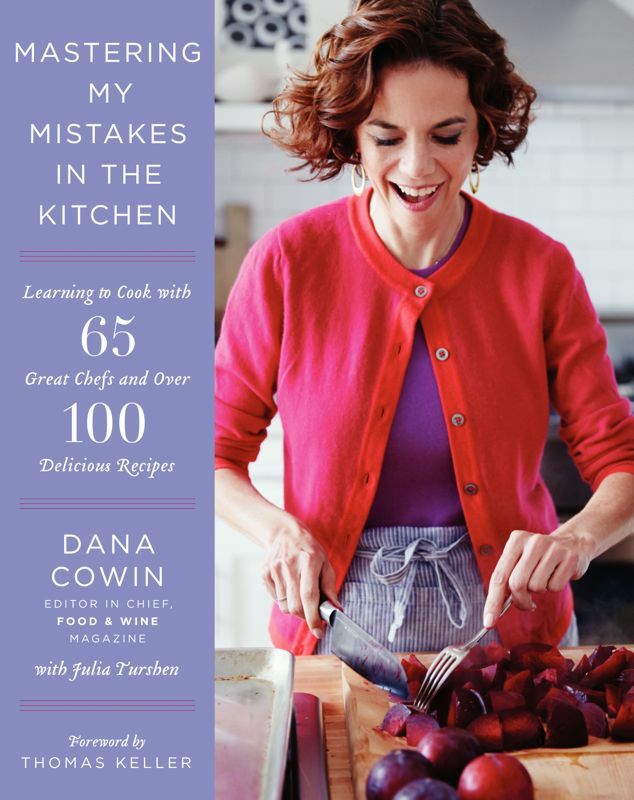 The cover is beautiful, and I’d love to learn how to correct some of my many mistakes in the kitchen. I love this! I make a lot of mistakes, but found the key is never, ever own them in your own kitchen. My family should just be grateful!! ha! Great concept for a book – would love to read it! Wow. This is so touching and beautiful — I now can’t wait to purchase this book. I absolutely agree that confidence is essential to cooking well (and living well too!) For me, as a reluctant grocery shopper, it also requires a sense of adventure. I make a lot of substitutions and changes to recipes because you never know! Let’s find out what would happen if . . . Totally agree. Learning to cook for me required a great deal of practice and practising built confidence. Beautifully written, as usual! I agree that the more you try and do, the more potential there is to screw up… but the more you will learn about yourself and your environment along the way. My daughter and I love cookbooks! We lived in a small town with no decent restaurants — Applebee’s was fine dining there. Because we enjoyed good food and nice wine, we learned to cook. I’m not saying that we’re good cooks but we cooked what we liked and enjoyed ourselves. And anything tastes pretty good when you’ve cooked it sharing a bottle of wine. I’d love to learn from Dana’s mistakes (and successes)! Leaving the house now to go coach Girls on the Run, a self confidence building program for young girls. I will come home to a meal of deconstructed burritos thanks to you! DALS rocks! love love love this post. i need to read it daily. Even though my kids are grown & gone I love reading your blogs. You are a natural born story teller like your would be professor. The F&W editor’s book sounds great too. Learning to cook for one, but not really wanting to eat frozen meals! a challenge! What a great idea. Would love to have this book. Love this! I currently do have a two year old pulling on my skirt (well, more like sweat pants) as well as a 2 week old baby. I could definitely use a shot of confidence where dinner is concerned! Amen! Kids get us out of our comfort zone in every way. If you’re not failing, you’re not learning. I love to cook. I wish that every time I cooked for others that things would turn out better than they tend to. Here’s to practicing over and over again – with confidence! Love your comment about screwing up but ultimately learning to try it again tomorrow. I’ve had the thought for years that if I learn from a mistake then it wasn’t necessarily a mistake. Thank you for the opportunity to win Dana Corwin’s new book. Thank you for bringing this book to our attention…hadn’t heard of it yet. I love Dana Cowin! She’s always one of my favorite guest judges on Top Chef. I’ve definitely become a better (home) cook since having a small person. It’s forced me to produce a healthy meal at approximately the same time every day. I’ve certainly become much better at improvising and refining some of our favourites, just due to the amount of practice. Like most any other skill, doing it every single day is one of the easiest ways to improve. I’m definitely not making “gourmet” meals or learning fancy techniques, but for the basics, there is a sense of greater ease in the kitchen. This is great. I’m still in those learning stages where mistakes are common but it’s all part of the fun in my book! I’ve enjoyed reading dana’s column over the years I can’t wait to see what she is up to with this talent crew of chefs! I look forward to seeing the list of the 65 chefs! Thanks for all your good work. ^^ @Melissa above , me too! we moved from a good size metropolitan area to a small town in Mississippi for a few years and that is when I learned to cook! otherwise it was 1.5 hr down the interstate to the nearest bigger city w good ethnic cooking etc. necessity is the mother of invention after all… i love Dana Cowin as well and her book looks great! So much truth right here! The scariest part is always taking that first step because you haven’t built up the faith in yourself to do the task at hand! Loved this post and the book looks awesome! I’m so glad to see a post about this book! 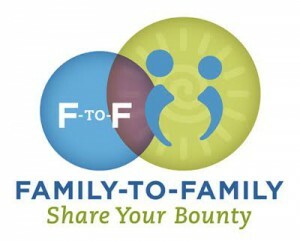 I love the premise – and what an opportunity to learn from the best. I have cooked with confidence for my family for nearly thirty years, but still get nervous, if not downright panicked, when cooking for new guests (especially good cooks). Would love this book! As a newly wed, I’m getting lots of practice and making tons of mistakes right now! Here’s to hoping we’ve got a few meals down pat before babies come along. This definitely looks like a book I need to spend some time with! 🙂 Thanks for letting me know about it. This post was so human, even if you dropped names like Eric Ripert. well said! what happens to that innate confidence we’re born with (that enables us to take our first steps and make words out of letters and sounds) as we grow older? too bad it takes so many years to win it back! 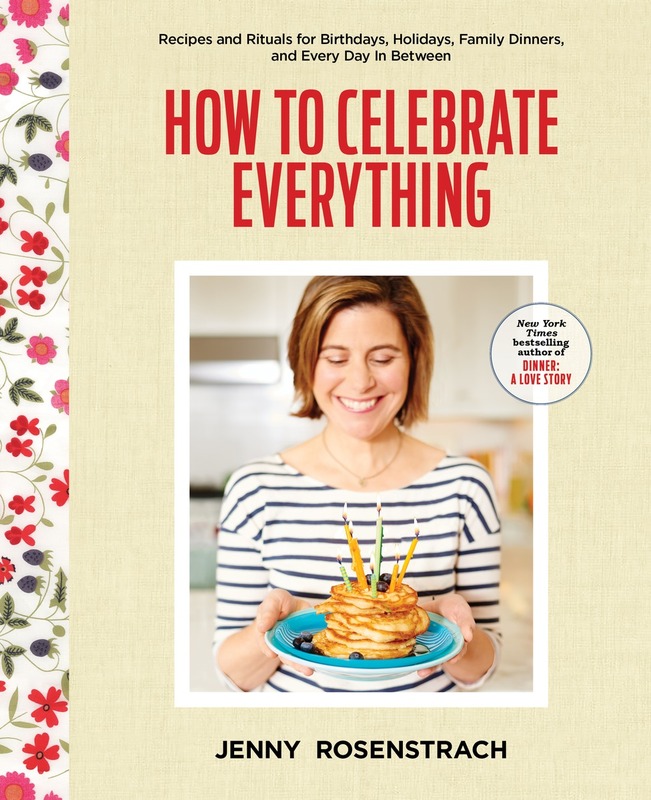 this cookbook looks like a great way to win it back in the kitchen! Yes and yes! I am someone who needs to know why, then I can do it with confidence. Love this! Great picture on the cover…Dana looks like she is having fun! There are so many things in the kitchen I have not attempted because I am scared of screwing it all up (like kneading bread dough and using a deep fryer). I should just get over it. heard Dana on radio cherry bombe and she was such a delight and great storyteller. Would love her book! it kills me when my friends complain about being bad cooks and then continue to not TRY anything! I totally agree that we need to be willing to try (and fail) at anything that intimidates us. Wow! What a great post! The book sounds like a very interesting read. I think you’ve got it about kids and cooking…they are relentless in their desire to be fed. But, they are also forgiving. If I I screw up, my kids are always happy to just eat cheese, berries and a bowl full of hummus for dinner, too. Such a vibrant cover! Would love to read. Who doesn’t want to improve on their cooking skills. Approaching your fears is HUGE! PS that cookbook cover is amazing! I’m so glad this book exists! In fact, it’s nice just to know that I’m not the only one that fears failure in the kitchen. It feels like there is so much at stake! I have learned…always more olive oil and more salt when roasting veggies! This is so true! I always naturally loved cooking, but it’s not like every dish I make is perfect. A lot of my friends lack the confidence to try and practice. sounds like a fantastic book! i’m learning to cook through trial and error. it’s such a confidence boost to be able to put something together without a recipe. Dude, her first mistake is wearing a cute sweater-set to cut plums. Black T-shirt, my friend, black T-shirt. That said, I love the concept of this book. Totally agree! Public speaking terrifies me, but I love that I can (usually) pull together a meal for 6 from whatever random ingredients I find in the pantry and freezer. I would never be able to do that if I didn’t try it, make mistakes, do it all over again! so true. since becoming more confident in the kitchen my whole family has benefitted! thanks for the chance to win! I would love this book because I can totally relate. I love the idea of being a good cook, but I am in my 20’s trying to navigate my way through cooking…normally I stick to the basics (stirfry, spaghetti, etc. ), but when Im feeling confident I try other recipes (i made risotto for the first time last night)!! This book would be a great way to muster up some more courage and try new recipes. we just made the pork ragu from your cookbook and it worked and we felt so happy. believe me, confidence is something that is a daily struggle in the kitchen, especially when we are so tired with two little ones (I have ruined more pots this year while cooking because my kids are 4 and 10 months and sleep is elusive in our house). but i know that 75% of the time, we cook well. and the other 25% might not be pretty, but it works. and i really need to stop making recipes for the first time when people come over :). thanks for the post – looks like a great read! First time commenting, but I love your blog. I’d love that book! Looks great! Perfect example of a recipe that makes me jittery–I am a very anxious pork- or ground meat-cooker. This would be a real leap of faith recipe for me. The book sounds great. But my real question is: what am I supposed to make the Greek-style shrimp and tomato dish in if cast iron will make the acidic tomatoes go bitter? Can’t wait to read this book. Love that she is owning her mistakes, so that others can learn from her! looks like a great book idea! What a wonderful lesson, and candid reminder about what (doesn’t have to) hold us back, even in the parts of our lives we love so much! Definitely confidence comes into play but also think trying to find something to make that will please the entire family as well as isn’t the same old, same old, in a reasonable amount of time with easy to find and not too expensive is my biggest obstacle! Cooking is a public performance of sorts, and the time and energy I put in raise the stakes for me. I need to be easier on myself. Would love to win the book! Thx for giveaway! The first time I had to get up and speak in public–in front of 300 or so parents of high school seniors–I thought I would die. My strategy was to tell them how nervous I was. That worked to relax me and I’ve been fine ever since. This is why mums (and dads), and grandmothers are the BEST cooks. They put tasty comfort food on the table every night, have kitchen knowledge that would be the envy of many a pro chef, yet they do this quietly, without shouting from the rooftops. Thank you for this post, it really is the heart of the matter! Sounds like an interesting book. I still get annoyed when I screw up a recipe, but know it’s part of the learning process. The pork sliders and cookbook look absolutely delicious! This book and concept sounds wonderful! New to your bog, happy to have found it! Love this post. It is so true that doing anything you are afraid of requires some level of confidence to just get started. I have this book on my list- would love to win a copy! So interesting to hear that someone a immersed in the food scene as Dana Cowin didn’t feel like she could cook well. 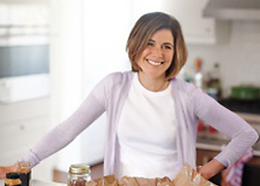 I love Dana Cowin–she’s so approachable and warm, and is always such a happy presence on Top Chef. Despite being someone who cooks constantly and often takes on advanced recipes, I still beat myself up (for days even) when a dish doesn’t work out. I probably get this from my father, who taught me to cook. He feels that mistakes when he’s cooking mean that maybe he’s lost his edge as he’s gotten older. I like the message of this cookbook, and how you describe it here. Would love a copy to share with my dad. I enrolled in, and dropped out of, public speaking class three times in college before I finally took it as a summer course. It’s still terrifying but I do it all the time for my job! I’ve been cooking for a long time but I’m not a natural at it like my husband is – a lot of that is confidence/anxiety. I really enjoyed this post and would love to have the book. I’ve been cooking for many years and I’m still learning from my mistakes! I don’t feel like I’m stretching my skills if I don’t have a failure now and then. I enjoy how your story ties into the theme of Cowin’s book, b/c everyone has something (often unexpected) that causes them anxiety. I’d love to read all the thing Cowin’s learned in the kitchen from her stellar cast of advisors! Oh, I’d love to have that book. I’m delighted to learn that my chicken trussing laziness – it never happens – has led to years of more rapidly cooked chickens! What a great premise for a cookbook! We would love to own this! Thanks! Both ‘Mastering my Mistakes’ and your dinner ‘playbook’ are on my holiday wish list. I keep reading blurbs about this book – would love to check it out! Just heard her on Radio Cherrybombe. Would love to read the book! Beautiful post! The book sounds fantastic! Thank you for this. I’m presenting to a big group of colleagues next week and I’m having a hard time shaking off the nerves. This helps though. I would love to read this book! I’ve made plenty of mistakes in the kitchen – some of them edible and some of them sending us out for dinner. But like you said, there’s always tomorrow to try again. Even if you don’t have kids, you have to feed yourself every day! Boy, could I use this book! thanks DALS for all the solids! This sounds wonderful! Even four years in to cooking for myself and my husband, I still have big FLOPS in the kitchen (Chicken piccata = EPIC fail. Baked goods that don’t set… you name it!) And that is such a bummer! It’s hard to pick yourself up and get back on the proverbial horse, so to speak. If Dana thought she could use some coaching, that’s something I’d like to read! Wow! What a great article! It is so true, though. We all have moments of great triumph and heartache in our lives and in the kitchen. It’s the grit to just keep living and keep cooking that helps us grow! Lots of practice and learning from your mistakes. It’s a good recipe for life, right? Learning from mistakes, I mean. (BTW, I’m asking for “dinner: the playbook” for hanukkah). It’s a feeling that never goes away, or at least rears it’s ugly head. I have been cooking professionally for just about five years and I’m STILL amazed that people pay money for what I make. This was a great post! Thank you. And the cookbook is beautiful! Thanks for being real. Just put this on my reading list. I always love watching Dana Cowen when she’s a judge on Top Chef. Would love to have her book! Sounds like a great cookbook. I would love to be entered. thanks! This sounds like a terrific book! Would love to win. Great post. :) I think so much in the kitchen comes down to confidence. In fact, when I hear people say that they “can’t” cook, I really believe that they don’t WANT to cook. And that’s completely FINE, but a completely different thing than fundamentally not knowing HOW to do something. As I age I realize that most of what I’ve learned about cooking has come from actually being in the kitchen. Crazy concept, I know. But just attempting it every day. Just doing it. Still a cooking work-in-progress. This book looks great! Ah, I have spent quite a bit of time waiting to be found out for the fraud I feel I am… It is best to keep things like attending culinary school out of polite conversation. Ahem. Wow, what a great idea. I have a handful of things that I am confident making, only because I screwed them up so many times!!! I’m awesome at making mistakes! Thank you for your posts. Totally agree about just doing it. I am not a chef but I cook most nights and will bake almost anything. I hate making mistakes and sometimes I’ll think about a recipe for a long time before trying it. But I will tell anyone who claims to not know how to cook (ahem, like my husband) that you just have to get in the kitchen and do it. If you know what tastes good, then you can learn to cook! I make miserable mistakes on the kitchen. I would love to win this book! Always comforting to know the experts aren’t perfect! This is so timely. Thank you. I am a former chef – who now lives/works in the software world as a Product Manager. (this means I design the things you use). As a cook – I am fairly fearless … I know the basics – and if something doesn’t work out – I review for “lessons learned”. Almost always – I am the harshest critic of the meal/dish – while everyone else just eats. Without much loss of confidence I just adjust for the next time (rapid iteration). What’s the difference in the two situations … and how do I come to grow and promote the lessons that I’m so willing to try and SHARE in my professional life? I never win anything, please pick me! Love this post. Switching the perspective from the nightly drudgery of dinner to practice makes perfect is genius. Thanks for the inspiration. I will use this argument to explain to my family why I try to cook nightly. It is so that I can make better dinners for us. Wow! Beginning to feel much better about my own short-comings and lack of confidence in the kitchen. Beautiful book- I am thinking I could learn a ton from Dana Cowin! Just leaving a comment intimidates me 🙂 looks like a great book!